When you think about it, the scope and intricacy of purebred refinement truly does qualify as breathtaking art. Breeds have been designed to perform just about every imaginable function. In that sense, some of these may be more accurately categorized as a lost art. Which brings us to the Nederlandse Kooikerhondje, one of two new breeds making their Westminster debut this February. Pronounced (Koi-ker-hond-yuh), the name derives from the Dutch word “kooiker” an ancient skill now almost lost to duck hunting lore. Basically, a kooiker was an expert decoyman and the term decoy derives from the related Dutch word “edekoy”. Several breeds, including the Kooikerhondje, developed in the early 1600s specifically to lure small game or waterfowl, came to be lumped together within the colloquial context of Tumbler. George Jesse, in his authoritative 1866 History of the British Dog offered a charming description of how these small “colly” type dogs worked in the fens of Essex enticing waterfowl into traps or nets. Similar accounts in purebred tradition can be found everywhere from Scandinavia to Japan and Canada. Bewick’s 1790 General History of Quadrupeds provided an equally delightful description of the Tumbler at work “so called from its cunning manner of taking rabbits and other game. It did not run directly at them, but in a careless and inattentive manner, tumbled itself about till it came within reach of its prey, which it always seized by a sudden spring”. Rather like a canine Pied Piper, other sources describe the inquisitive, versatile little Tumbler flushing small prey within shooting range or working in tandem with falcons. Regardless of geographic origin or hunting specialty, all decoy breeds share a few defining functional traits which fitted them to this unique method of undercover deployment. They were typically agile, compact, and moderate size, in order to easily maneuver through dense reeds and underbrush without alarming their prey. Notably strong, supple swimmers with pronounced retrieving instinct, they are naturally attentive, sensitive, playful, sweet and disarming. However, their most distinctive shared trait is their reddish color and heavily feathered, white tipped tail. Carried perpetually in motion, it works like a glittery fishing lure, fascinating and enticing intended prey that catches a fleeting glimpse of it. The invention of firearms pretty much put this branch of waterdog operations out of business by the 18th century. By then, several breeds had been perfected for this purpose. Best known today is the Nova Scotia Duck Tolling Retriever, AKC recognized back in 2003, and an acknowledged descendant of Nederlandse Kooikerhondje brought to Canada by European waterfowl hunters centuries earlier. This ancestral breed unfortunately didn’t fare so well back home in The Netherlands. By the 20th century it neared extinction. Then in the 1930s, Baroness van Hardenbroek stepped in and rescued it from the brink of oblivion. A breeding program she established in 1939 led to its recognition in by the Raad van Beheer in 1971 and FCI acceptance in 1990. America’s first Kooikerhondje litter was whelped in 1999 and the breed entered FSS in 2004. The Nederlandse Kooikerhondje Club of the United States was designated as the official AKC parent club in 2014, and it joined the Sporting Group in 2018 as AKC’s 191st breed. 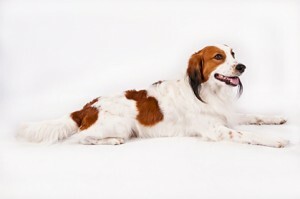 FCI categorizes the Nederlandse Kooikerhondje as a Flushing Retriever, however exempts it from working trials, which implies the breed’s functional obsolescence. That’s understandable, considering that decoy hunting truly is an art requiring extreme technical skill, infinite patience, and a deep understanding of animal behavior. Luckily, this time honored art still holds fascination for a few devotees. Nobody is getting rich off of it, but like this captivating breed, there are enough dedicated fans making sure that it never dies out. Posted by chesliepickett on Jan 3 2019. Filed under Current Articles, Featured. You can follow any responses to this entry through the RSS 2.0. Both comments and pings are currently closed.